Mac n cheese. It conjures up memories of childhood events at my grandmothers townhouse in Annapolis. The adults gathered around the polished dining table over glasses of red wine. Ham biscuits, green salads, cheese casseroles set glistening on silver platters and wooden trays. The kids watched all of this from the tiny kitchen where we sat in eager anticipation of our boxed / canned dinner. I have a vivid memory of my grandmother simmering mac n cheese and spaghetti-O's on her electric stove, her hair bobbed and perfectly coifed. Her deep red lipstick glittering in the yellowish light of the single kitchen lightbulb. The scent of hairspray and perfume filling the kitchen and mingling with the scent of powdered cheese and/or ketchup-like meatball sauce. My brother, cousins and I were fiends for Kraft & Chef Boyardee everything. And we only ever got it at these sorts of events. When the grown ups wanted some time to themselves to kibitz over family drama. I grew out of my packaged food cravings around 15, thank god. But mac n cheese holds a special place in all of our hearts, doesn’t it? It represents some level of childhood autonomy con motherly love. Mom buys the mac, we make the mac. Then we feel like a friggin genius if we put something fancy in it like… pepper. My 13 year old self was pretty proud of that one. Fast forward to me as a yogi chick who eats things like hemp hearts and avocado toast and tamari sautéed kale. My disdain for the boxed and canned “food” of my childhood cannot be quantified. But that doesn’t stop me from wanting to eat mac n cheese. What’s a dairy free, gluten free babe to do? Make vegan sweet potato mac n cheese. That's what. I’ve made many a vegan cheesy sauce in my day. There are lots of ways to do it. There’s “roux” style (oil & flour whisked together with nutritional yeast in a hot saucepan). Then there’s straight-up fake cheese melted with a bit of oil and coconut milk. Let’s not forget about cashew “cheese” sauces (soaked cashews + lemon + nutritional yeast). The list goes on and on. Most plant based “cheese” sauces rely on nuts for creaminess and/or nutritional yeast for that cheese-like umami flavor. And that’s fine, really. Both of those ingredients offer something essential to a plant based cheesy sauce. However, if you’ve ever made an un-cheese sauce than you know there tends to be something missing. And I’ll tell you what it is. Balance. The best flavor development comes when different flavor elements are balanced properly within a dish. You want salty, sweet, umami, bitter, and sour flavors to support each other and intermingle. No one flavor should dominate. It’s why we add sour, salty or bitter flavors to foods that are too sweet (e.g. oatmeal cookies with lemon zest). Sweet flavors to foods that are too sour (e.g. candied lemon peel). Salt to foods that are bitter (e.g. salted dark chocolate). Not only does a balanced complex of flavors create a particularly delicious dish. It also brings out more of the flavor in individual ingredients. While we're on the topic of balance, I’d like to throw in my trick for enhancing umami in plant based dishes. Include something fermented. Especially any food or drink with active yeast or bacteria. I’m talking unpasteurized miso, sauerkraut juice, kimchi juice, live cultured pickle juice. I’ve also been known to add beer, wine and vermouth to my dishes, although usually only to those that cook off the alcohol. Even just a dash of a raw-fermented or alcohol-fermented food will enhance savory flavors significantly. Todays cheesy sauce has roasted sweet potato as a base. I like using starchy squash and sweet potato for vegan cheesy sauces because the fiber creates a smooth mouthfeel and gives the sauce heft. Plus roasted squash and sweet potato provide lots of naturally sweet flavor on their own. And they give cheesy sauces a pleasant, golden color. Reminiscent of Kraft Mac n Cheese and a childhood unawares of what yellow 5 and 6 do to your body (hint: it’s cancer). Roasting sweet potato brings out its brown-sugar sweetness. Into the blender, along with the cooked sweet potato, goes the expected nut/seed combo (I used hemp & sunflower seeds because I like the grassy and nutty flavors). And then nutritional yeast. Are you with me so far? I could have just stopped here. But then the sauce would be rather flat and lackluster. I add browned onion & garlic for that distinct umami flavor caused by the Maillard Reaction (when food browns and caramelizes under heat). Unpasteurized mellow white miso gives the sauce je ne sais quoi, complexity, interest. Olive oil adds satisfying fats and a mellow bitterness. Then, of course, salt and pepper do their thing to enhance and round out the natural sugars in the roasted sweet potato. And for all of that depth of thought, it’s a very easy recipe. Blender sauce + pasta, y’all. Ain’t nothin’ to it. It’s my hippie-dip version of in-your-face comfort food. Except when I’m done scarfing a couple of bowls of it I’m ready for a freaking hike up a craggy mountain. Unlike most vegan cheesy mac, this dish is actually good for you. It’s packed with protein, healthy omega fats, B vitamins, Vitamin A, potassium, probiotics, and fiber. Eat well, live well. That’s my motto, dudes. A 30 minute vegan mac n "cheese" made with sweet potato, hemp hearts, and sunflower seeds. 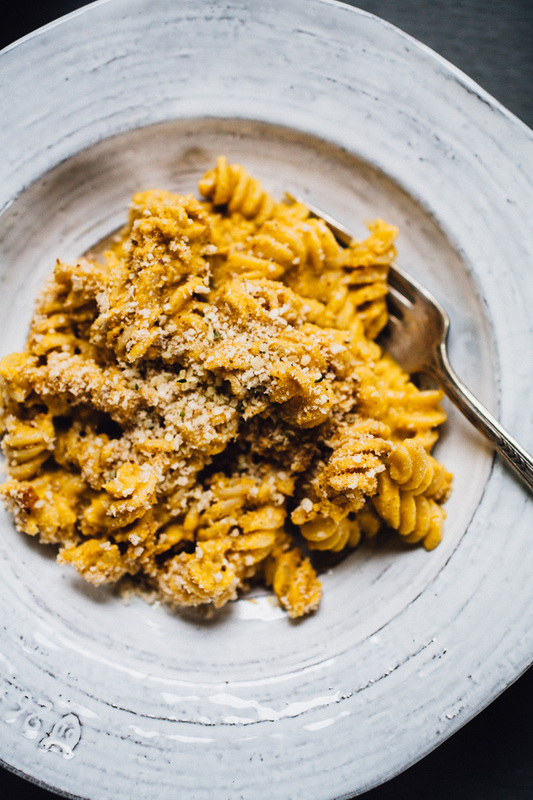 A creamy, umami-rich vegan mac that's actually good for you! Sauté the onion with a drizzle of olive oil in a cast iron skillet (or large sauté pan) set over high heat. Stir occasionally. Cook until the onions caramelize and brown, 5-8 minutes. Add the minced garlic and cook 1-2 minutes more, until the garlic browns and becomes aromatic. Remove from heat. To the bowl of a high powered blender, add the onion and garlic, roasted sweet potato, hemp hearts, sunflower seeds, miso, nutritional yeast, olive oil, water, salt and pepper. Blend on high until completely creamy. Add more salt or pepper, to taste. Once the pasta is cooked, drain the pasta of water. Then rinse the pasta in cold water, breaking up the noodles with your hands, and drain again (this removes the excess starch that makes gluten free pasta stick together). Add the pasta to your cast iron skillet (or serving dish). Drizzle with olive oil and toss. Add your slice of toast to the (clean and dry) bowl of your blender. Pulse until the toast breaks up into semi-fine breadcrumbs. Add the "cheesy" sauce to a pot and bring it to a simmer, stirring relatively constantly. Pour the "cheesy" sauce over top of the noodles and toss everything together. Top with the breadcrumbs and serve immediately. Enjoy! Cook & prep time doesn't include the time it takes to roast / cook sweet potato. [br]My sweet potato roasting method: Preheat the oven to 375F. Cut the sweet potato into 3 inch pieces. Toss with olive oil. Lay out over a parchment lined baking sheet. Roast for 25-30 minutes, until the sweet potato is fork tender. Let cool completely before peeling the skins off of the sweet potato.